Members of the Lee and Lois Herndon Chapter of Tennessee Ornithological Society held the annual Spring Bird Count on Saturday, May 3. The count has now been held for several decades and is conducted in the five-county area of Northeast Tennessee that includes the counties of Carter, Johnson, Sullivan, Unicoi and Washington. Photo by Bryan Stevens The American Robin ranked as the most abundant bird on this year’s Spring Bird Count for Northeast Tennessee. A total of 40 individuals in nine parties looked for birds on a beautiful May day, which in itself was a slight change from the way the count has been conducted in the past. The count has traditionally been conducted the last weekend in April but was moved back this year so as not to compete with the Roan Mountain Spring Naturalists Rally, which was held a week earlier than its usual date. Those taking part in the count were Fred and JoAnn Alsop, Jim Anderson, Paul and Emily Bayes, Jerry Bevins, Rob Biller, Kevin and Dallas Brooks, Ron Carrico, Harry Lee Farthing, Paul Haynes, Don Holt, Heather Jones, Caitlyn King, David Kirschke, Rick Knight (compiler), Roy Knispel, Tom Laughlin, Richard Lewis, Vern Maddux, Larry McDaniel, Joe McGuiness, Tom McNeil, Charles Moore, Cathy Myers, Kathy Noblet, Brookie and Jean Potter, Amy and Scott Reys, Chris Soto, Bryan Stevens, Kim Stroud, Byron Tucker, Gary and Brenda Wallace, Mary Anna Wheat, John Whinery and Rex Whitfield. I know I am always enthusiastic on the day of a spring count, and I suspect the same holds true for other participants. You never know what unexpected bird might make an appearance for this annual survey. Some of my own good finds this year included Yellow-crowned Night-heron, Yellow-breasted Chat, Yellow-billed Cuckoo and Orchard Oriole. A total of 157 species found fell somewhat short of the all-time record of 161 species, which was established back in 2005. The average number of species for this count is 147. My friend, Byron Tucker, who was visiting from Atlanta, Ga., got to take part and also make his first visit to Holston Mountain in Carter County. He said he enjoyed the outing. We counted with Elizabethton residents Gary and Brenda Wallace. My favorite warbler – Hooded Warbler – tied with Ovenbird as the most abundant warbler tallied for this year’s spring count with 173 individuals counted for both these species. A total of 27 warbler species made the count, as well as one Brewster’s Warbler, which is a hybrid between a Blue-winged Warbler and Golden-winged Warbler. I’m thrilled to report that the most abundant bird on the count wasn’t the European Starling. 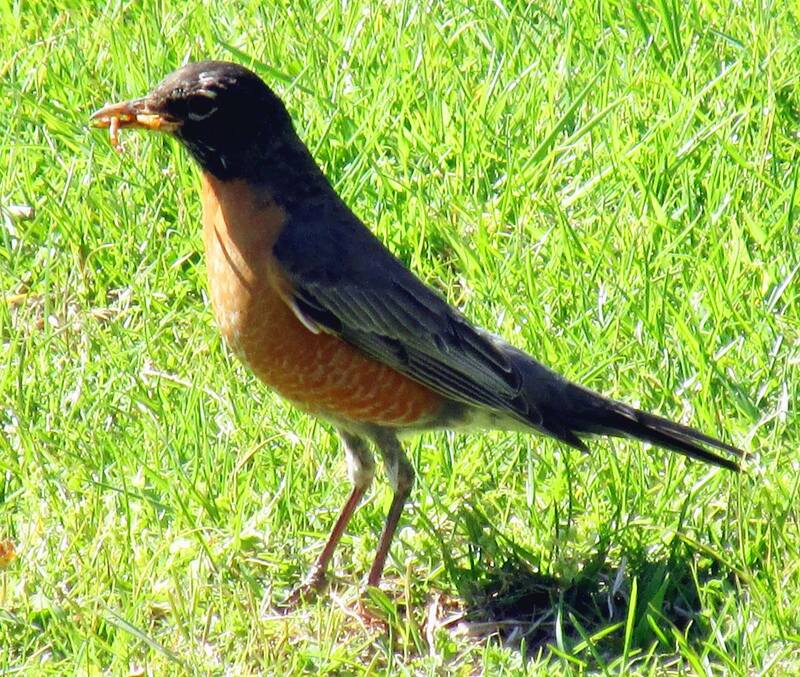 That honor went to the American Robin with 960 individuals reported by counters. The European Starling came in second with 865 individuals. Other common species included Cliff Swallow (806), Canada Goose (580), Red-winged Blackbird (469), Common Grackle (401) and American Crow (341). A Canvasback found on a pond in Washington County established a new late date for this duck in Northeast Tennessee. Other species of interest making the count included Western Sandpiper, Gray-cheeked Thrush, Blackpoll Warbler and Sora. Canada Goose, 580; Wood Duck, 53; Mallard, 183; Blue-winged Teal, 11; Canvasback, 1; Lesser Scaup, 1; Hooded Merganser, 1; Ruffed Grouse, 4; Wild Turkey, 40; Common Loon, 11; Horned Grebe, 1; and Double-crested Cormorant, 53. Great Blue Heron, 79; Green Heron, 11; Black-crowned Night-heron, 1; Yellow-crowned Night-heron, 1; Black Vulture, 62; and Turkey Vulture, 214. Osprey, 11; Sharp-shinned Hawk, 3; Cooper’s Hawk, 10; Bald Eagle, 11; Red-shouldered Hawk, 3; Broad-winged Hawk, 10; Red-tailed Hawk, 41; American Kestrel, 11; and Merlin, 2. Virginia Rail, 1; Sora, 1; American Coot, 1; Killdeer, 32; Spotted Sandpiper, 68; Solitary Sandpiper, 43; Greater Yellowlegs, 1; Lesser Yellowlegs, 2; Western Sandpiper, 1; Least Sandpiper, 21; White-rumped Sandpiper, 4; and Wilson’s Snipe, 4. Bonaparte’s Gull, 3; Ring-billed Gull, 54; Rock Pigeon, 182; Eurasian Collared-Dove, 1; Mourning Dove, 204; and Yellow-billed Cuckoo, 2. Eastern Screech-Owl, 8; Great Horned Owl, 6; Barred Owl, 10; Northern Saw-whet Owl, 2; Common Nighthawk, 4; Chuck-Will’s-Widow, 8; and Whip-Poor-Will, 31. Chimney Swift, 238; Ruby-throated Hummingbird, 28; Belted Kingfisher, 19; Red-headed Woodpecker, 2; Red-bellied Woodpecker, 82; Yellow-bellied Sapsucker, 5; Downy Woodpecker, 20; Hairy Woodpecker, 10; Northern Flicker, 41; and Pileated Woodpecker, 42. Eastern Wood-Pewee, 11; Yellow-bellied Flycatcher, 1; Acadian Flycatcher, 27; Willow Flycatcher, 3; Least Flycatcher, 7; Eastern Phoebe, 54; Great Crested Flycatcher, 11; and Eastern Kingbird, 82. White-eyed Vireo, 17; Yellow-throated Vireo, 10; Blue-headed Vireo, 63; Warbling Vireo, 6; Red-eyed Vireo, 151; Blue Jay, 225; American Crow, 341; and Common Raven, 16. Horned Lark, 2; Northern Rough-winged Swallow, 223; Purple Martin, 61; Tree Swallow, 271; Barn Swallow, 284; and Cliff Swallow, 806. 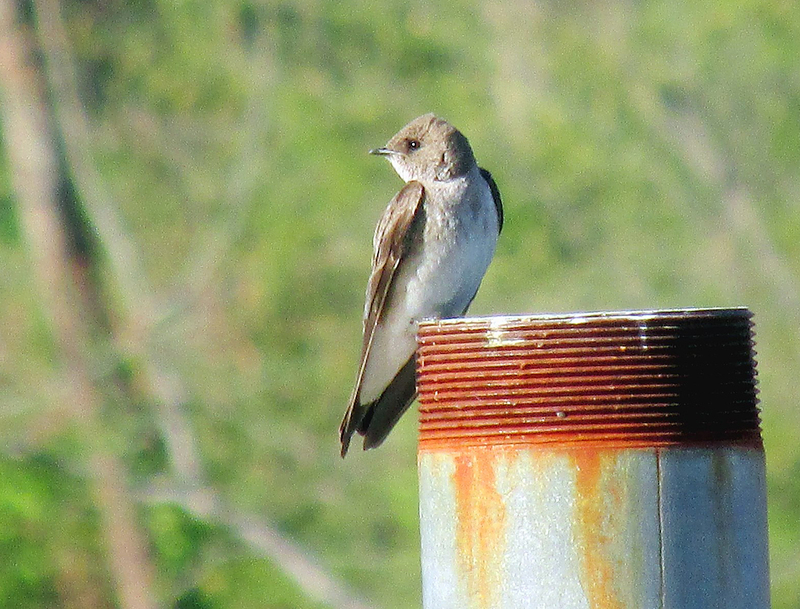 The Northern Rough-winged Swallow was represented on the spring count by 223 individuals. Carolina Chickadee, 147; Tufted Titmouse, 165; Red-breasted Nuthatch, 7; White-breasted Nuthatch, 25; and Brown Creeper, 7. House Wren, 45; Winter Wren, 5; Carolina Wren, 134; Blue-gray Gnatcatcher, 84; Golden-crowned Kinglet, 2; and Ruby-crowned Kinglet, 8. Eastern Bluebird, 151; Veery, 12; Gray-cheeked Thrush, 1; Wood Thrush, 67; American Robin, 960; Gray Catbird, 37; Northern Mockingbird, 128; Brown Thrasher, 43; European Starling, 865; and Cedar Waxwing, 59. Ovenbird, 173; Worm-eating Warbler, 25; Louisiana Waterthrush, 19; Northern Waterthrush, 2; Golden-winged Warbler, 1; Black-and-white Warbler, 53; Swainson’s Warbler, 6; Kentucky Warbler, 4; Common Yellowthroat, 22; Hooded Warbler, 173; American Redstart, 10; Cape May Warbler, 2; Northern Parula, 28; Magnolia Warbler, 2; Blackburnian Warbler, 12; Yellow Warbler, 10; Chestnut-sided Warbler, 25; Blackpoll Warbler, 1; Black-throated Blue Warbler, 61; Palm Warbler, 3; Pine Warbler, 9; Yellow-rumped Warbler, 42; Yellow-throated Warbler, 34; Prairie Warbler, 3; Black-throated Green Warbler, 97; Canada Warbler, 30; Yellow-breasted Chat, 19; and Brewster’s Warbler, a hybrid of Blue-winged and Golden-winged Warblers, 1. Eastern Towhee, 179; Chipping Sparrow, 166; Field Sparrow, 55; Savannah Sparrow, 3; Song Sparrow, 259; Swamp Sparrow, 2; White-throated Sparrow, 11; White-crowned Sparrow, 24; and Dark-eyed Junco, 56. Summer Tanager, 4; Scarlet Tanager, 78; Northern Cardinal, 212; Rose-breasted Grosbeak, 40; and Indigo Bunting, 69. Bobolink, 1; Red-winged Blackbird, 469; Eastern Meadowlakrk, 100; Common Grackle, 401; Brown-headed Cowbird, 88; Orchard Oriole, 27; and Baltimore Oriole, 27. House Finch, 38; Pine Siskin, 1; American Goldfinch, 301; and House Sparrow, 93. This entry was posted in Birding, Birds, Carter County Compass, Elizabethton Star, Erwin Record and tagged Northeast Tennessee Spring Bird Count, Spring Bird Count on May 11, 2014 by Bryan Stevens.